Taylor Swift gave a live rendition of her latest single, Everything Has Changed at the Macy's Fourth Of July celebrations. 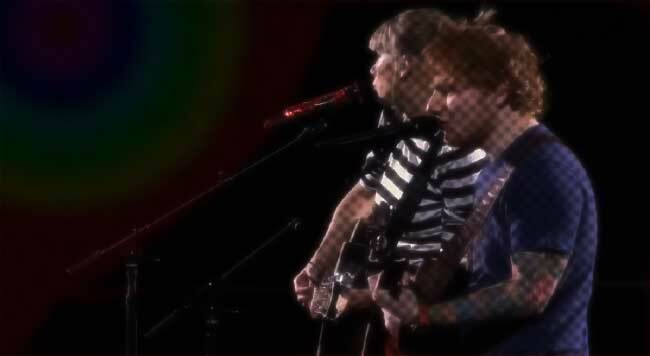 The song, taken from fourth album Red, features British vagabond Ed Sheeran, who crossed the Atlantic ocean (tiny guitar in hand) to join the Diva on stage in Texas. It was a nice performance from the pair, but Taylor did seem slightly more subdued than normal. Though, to be fair, she was hardly going to be doing back flips on that elevated stage. Oh well, enjoy! I really don't like Taylor Swift at all, but I do enjoy this song. And her vocals here didn't make me want to punch a wall, so well done Miss Swift. My laptop is still having audio problems and I can't watch to the performance, so I want to thank you for confirming that it's on-key....her first on-key performance is a long time...This is emotional for me, sorry, lemme go grab a few tissues. Sorry to hear that, must be a bummer to have those audio problems. But didn't you say it was the speakers? Why not use headphones in that case? And yes I'm basking in fan pride (even before listening to the thing). I'll go watch on mobile and when I hear for myself that she did well, I'm gonna need even more tissues. She's overrated and he is just, ugh. I feel you could just as well go the other way around too. Both are incredibly Meh to me. I really don't get the Ed's popularity anymore than Taylor's. Ed is doing stuff I know many dudes been doing for ages and much better than he does. Americana is rife with guys with guitars singing folk like " sensitive" tunes. Taylor's popular because she writes songs that are relatable to the younger generation (and some of the older), and can play various instruments (regardless of whether she can play them well or not) including the guitar (acoustic, electric, 12-string), electric banjo, ukelele, piano and drums, sings live(regardless of whether she sings and writes them well or not), doesn't use auto-tune and has a good-girl image that comes off as natural without being forced. That's why she's popular. That's why I say, Young Tan could just as easily have turned that statement around. Ed is the same. very popular for doing something many others do much much better. I guess the other acts that do what Taylor does, but better, and aren't as successful/popular as her, weren't well-promoted or given enough exposure by their labels. There's no other possible explanation imo. If there were better artists (who did the same thing) and were given as much promotion as her, they'd certainly be more popular/successful than her. That demographic would cater to them not her. That's what I said Ahmed, they didn't get the media exposure. Which isn't always the willingness or effort of the label but the size of the label. Of course most of them don't care for that kind of fame so it works out for them. Just makes it harder for music lovers to find them. Almost every singer has their voice tuned one way or an other in their recordings, more or less. And knowing that she sounds so off key live it's absolutely sure that her voice is tuned. Taylor doesn't use auto-tune. She goes off-key because her sense of pitch isn't well-developed (tone deaf). I think Mark might have meant her studio vocals. He did specify..."in their recordings" . And seeing as how often she goes off key live, obviously her studio vocals have been tuned ...substantially. Least, I haven't heard her go off key in official recordings. Um, what you don't realize is that she goes off-key in almost every single recorded song (studio vocals). The problem is not in live or studio. The problem is that her sense of pitch is in many ways a mess. Anyway, people don't buy her albums for the singing only. There other factors that contribute to the album's quality, as long as the singing is bearable though. She doesn't go extreeeemmmeeely off-key (most of the times), she just gets a bit flat. Yes, I am aware these days people do not necessarily buy music albums by singers for the singing anymore. For example, I don't like Carole King's voice/singing a lot, but she's a very good songwriter which compensates for my slight dislike for her timbre. So that's why I stand by the great importance of production and songwriting to produce a good (as long as the vocals are at least okay). Well off key to me does not rate as " okay". It rates as amateur who doesn't deserve a recording contract in my book. Not much caring for the voice is not going to make me buy an album either tbh. Of course for me personally...Taylor falls in both categories. Amateur singing with a voice I don't like. I for one don't hate either. They seem pleasant enough folk. I just think, at what they do, within their genre, they are highly overrated. Yes, i think the differences in what we each consider okay have been thoroughly covered. Yes, I know that wasn't James Taylor. But due to my speakers' condition, I couldn't listen to it and can't therefore can't comment on its quality. The James Taylor cover is the one I heard before and I love it. Well, when you can, you should listen to Ofra. Beautiful voice. One of the most beautiful there has been in popular music. and though in Hebrew, she sang a lot of music inspired by her yemenite background. Big Arabic influence. Great person also, believer in peace through mutual understanding through music. Well, I've never really learned Hebrew before (I've learned Arabic, English and some French. Spanish and Italien are on my to-do list :) ), so I'm pretty sure I won't understand a thing. But from what you've said, she seems like someone I might check out. My Hebrew is practically non existent Ahmed. But her voice is gorgeous and I like the melodies. Also she sometimes sings in English or French. Well I'll make sure I check her out when my speakers (ever) work again.